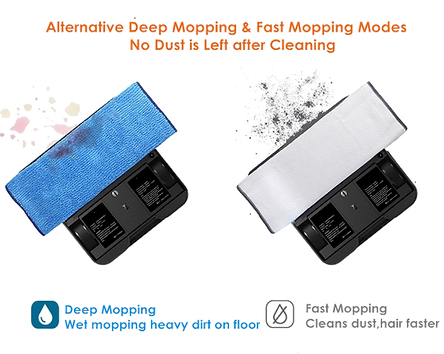 It works with moist or dry microfiber cloths, which can be washed and reused. In the dry mode, Mamibot Sweepur 120 covers up to 110m2, while in the damp mopping mode, the handy small water tank covers 37m2. 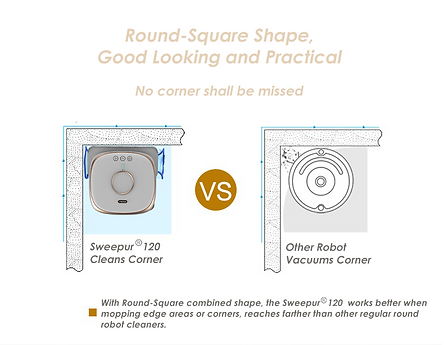 Floor mopping made easy with the Mamibot Sweepur 120! Optionally a water tank or a cleaning sole can be installed at the bottom of the unit. With the integrated tank, the Mamibot Sweepur120 supplies the blue wipes evenly with water and can thus also clean larger floor surfaces wet. 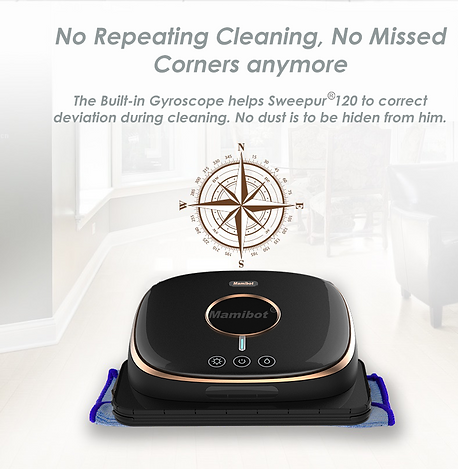 The Sweepur 120 can even cover up to 110 m2 of floor space in a dry-wiping mode. The robot can be used on various types of floors, such as tiles, laminates, vinyl, PVC and many more. 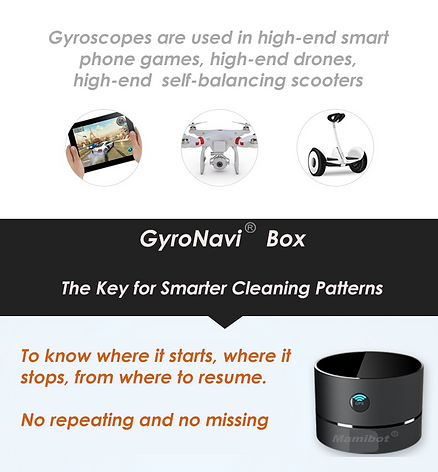 With support of the GyroNavi Box, the Mamibot Sweepur 120 easily navigates within the premises. The floor mopping robot thereby recognizes which area has already been wiped, and which has not yet. So really no place remains uncleaned. The intelligent anti falling sensors ensure sufficient safety at stairs or steps so that the wiper does not fall down. The anti-collision sensors provide sufficient protection and safety. The floor mopping robot recognizes furniture early and moves around during the cleaning process. Due to its low weight and its practical, square size, the possibilities of using the Mamibot Sweepur 120 floor mopping robot are almost unlimited. This smart helper will save you a lot of trouble in the future! Pal N Paul Incorporation deals in Ambrogio Grass Cutter Robot, Mamibot Vacuum Cleaner Robot, Mamibot Glass Cleaner Robot, NEMH2O Swimming Pool Cleaner Robot, LTE Duct Cleaner Robot and more. The companies belong to different parts of the world including Italy, USA and Canada. We are authorised dealers of all these brands in India. There are dealers and service centers of lawn mower robot, vacuum cleaner robot, glass cleaner robot, pool cleaner robot and duct cleaner robot all over India. You can find the nearest service center on the dealers page. If you face any kind of problem with your robot grass cutter, robot floor cleaner or any other robot you can directly contact the nearest service center. We deal in some of the most advanced robot grass cutters, robot vacuum cleaners, robot glass cleaners, etc in the market today. These robots are built with latest technologies like 3D mapping, smart navigation, auto charging, rain sensors, obstacle detection, etc. Every lawn mower robot, floor cleaner robot and pool cleaner robot comes with Android and iOS mobile apps. You can easily control these machines with your smartphone. Once you have set weekly or daily schedule of cleaning you will not have to worry about it again. The robot will cut the grass, clean the floor or clean the swimming pool on the scheduled time and return to its charging port. As for glass cleaner and duct cleaner robot, you can control them with their remotes. If you face any problem or have any doubts about using or controlling the robot grass cutters, robot vacuum cleaners, robot glass cleaners, robot pool cleaners or robot duct cleaners you can contact us and ask for assistance. We understand that the concept of lawn mower robot, vacuum cleaner robot, glass cleaner robot, pool cleaner robot and duct cleaner robot is completely new in India. Thus, we provide a free home demo so you can see the machine in action before you decide to buy it. You can call us or email us with your name, mobile number, address and the robot you are interested in. Your nearest dealer will get in touch with you.